Victor-Marie Hugo was a French poet, playwright, novelist, essayist, visual artist, statesman, human rights activist and exponent of the Romantic movement in France. FCIT. "Victor Hugo author page." Lit2Go ETC. Web. 22 April 2019. 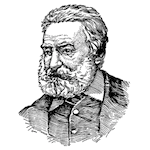 <https://etc.usf.edu/lit2go/authors/116/victor-hugo/>. FCIT, "Victor Hugo author page." Accessed April 22, 2019. https://etc.usf.edu/lit2go/authors/116/victor-hugo/.